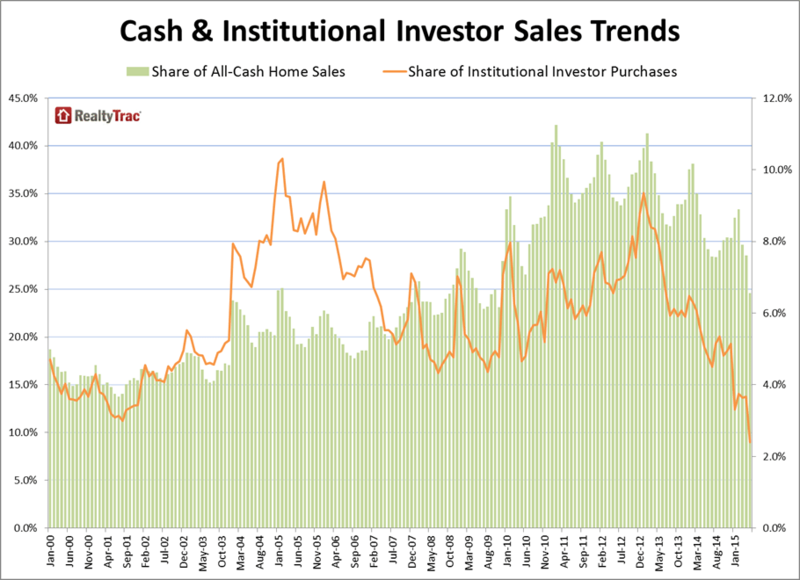 The percentage of single-family homes and condos purchased with all cash or by institutional investors hit record lows in May. Nearly 25 percent of all home sales in May were all cash purchases, according to RealtyTrac’s U.S. Home & Foreclosure Sales Report. This figure represents the lowest level of all-cash closings since November 2009. A year ago, more than 30 percent of buyers closed with all cash. The share of institutional investors — entities purchasing at least 10 properties in a calendar month — dropped to 2.4 percent of single-family home sales in May, the lowest level since January 2000. The most common states for all cash deals in May were New Jersey and Florida, with these transactions accounting for nearly 48 percent of all sales in both locales. New York (38.8 percent) and Massachusetts (37.1 percent) followed. Purchases made by institutional investors accounted for 5.6 percent of all sales in Georgia during May and for 6.4 percent of deals in Oklahoma. Nebraska followed at 5.1 percent. The recent RealtyTrac report also touched on sales prices. The median cost of a nondistressed residential property in May was $205,000, a 9 percent increase from May 2014 and a 6 percent rise from the previous month. Nondistressed home prices have now escalated for 37 straight months. The median cost of a distressed residential property stood at $116,192 in May, down 2 percent from a year ago. Distressed sales accounted for 10.5 percent of all residential sales during May, the lowest level since January 2011. Bank-owned sales accounted for 3.9 percent of this volume, with properties selling while in foreclosure comprising the other 6.6 percent. States where distressed sales accounted for a high percentage of total residential sales in May include Illinois (18.6 percent), Florida (16.3 percent), Michigan (15 percent) and Delaware (14.9 percent).